From the Holy Land to Graceland (Gary Vikan): It is always refreshing to read a book about Elvis which considers his importance beyond just his music and considers him from a wider socio-cultural, political and/or religious perspective. As its title suggests, From the Holy Land to Graceland by respected academic researcher and author, Dr. Gary Vikan, is one such book! 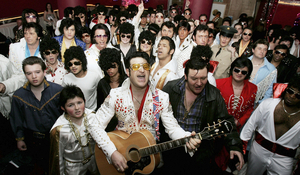 In his fascinating book, From the Holy Land to Graceland, renowned Byzantine scholar, Dr. Gary Vikan, puts forward a compelling case that, 35 years after his death, Elvis is a secular charismatic who engenders a fervent worship in his congregation (fans). In his book, Vikan enthralls the reader and invites you to seriously consider numerous intriguing ideas which place the notion of Elvis Presley in a seminal, albeit non-music context. Dr Vikan opens the readers mind and eyes to these important concepts, clearly showing how the contemporary worship of Elvis structurally mirrors traditional religious worship. As a miracle-working charismatic martyr, Elvis differs from most of his counterparts, and from Christ and Saint Simeon, by virtue of the fact that his primary vehicle for making contact, for "being there", both pre- and postmortem, was and is his singing voice. True, music has always been an integral part of the Christian icon experience as well, but in reverse: believers sing to icons, not the other way around. 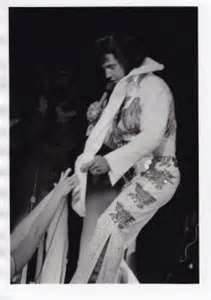 As I read From the Holy Land to Graceland it struck me another question that could be asked is to what extent Elvis' music is becoming obscured, lost or overwhelmed by the "new" socio-cultural-secular/religious Elvis? However, this is a question for another day! Elvis pictures have been so prevalent in this medium that they have their own term of identification: an Elvis on velvet* is a Velvis. 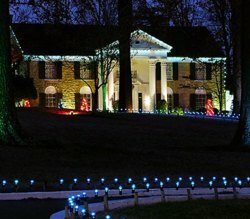 What is flawed in attempts to interpret the Elvis/Graceland phenomenon within the framework of conventional religion are not the (mostly murky) answers, but rather the question itself. 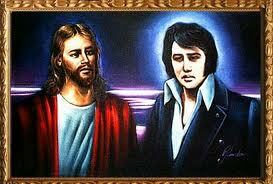 The religious dimension of the Elvis/Graceland phenomenon should not be sought in its relative alignment with the central theological and organizational building blocks of the world's great religions; rather, it should be sought on religion's "edges" - in the much less organzed and structured world of charismatics, holy places, and pilgrimage that all religions, to some degree, share in common. 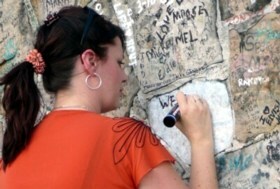 Despite its seemingly heavy theme, From the Holy Land to Graceland is accessible to all readers. This is thanks to Dr. Vikan's fluent, evocative writing style which brings his ideas to life in a richly colorful and stimulating way. The effusive narrative is illuminating and is likely to convince many of those who question the concept of Elvis as Saint. At other junctures, Vikan interweaves an impressive tapestry of seemingly unrelated events or things where each one resonates with subliminal meaning in the context of Saint Elvis. From Elvis having lived before and the apologia of Dr. Nick to the iconographic affirmation by fans at the Days Inn during Elvis Week and Albert Goldman's meanspirited "Contra Elvis", there is a wondefully eclectic range of material to savour and digest. Vikan's discussion of other modern day icons and their holy places allows a more rounded understanding of the phenomenon of secular sainthood. The events and their holy places discussed include the terrorist attacks of 7/11/Ground Zero while the icons include JFK/the grassy knoll in Dallas; Martin Luther King Jr/Lorraine Motel in Memphis and Princess Diana/Place d'Alama in Paris), with the author offering insight as to why some have ongoing fascination (worship) while interest in others is or may only be temporal. .... the absence of an acknowledged paramount Jackson locus sanctus, with a body and relics, will inevitably militate against his ever reaching the Elvis/Graceland level. The narrative of From the Holy Land to Graceland is generously complemented by 130 quality color image plates which reinforce the author's key messages. Connecting early Christian pilgrimages to the veneration of Elvis and his home, this book should be read by anyone fascinated with the King and the King of Kings, the South, or the relationship between sacred space and culture. Verdict: From the Holy Land to Graceland is a cogently written and stimulating treatise which vividly brings to life why Elvis can rightly be viewed as a secular saint. It is one of the most thought provoking and interesting Elvis books in recent years. The King is dead! 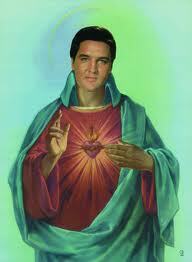 Long live Saint Elvis! * EIN recommends readers check out the wonderful recording by the Stray Cats, Elvis on Velvet and another great track, the somewhat disturbingly obsession based Velvet Elvis by Alex Winston. From the Holy Land to Graceland is now available in the US and will be released in the UK in a few weeks (see links above). About the author: Until late 2012 Gary Vikan served as director of the Walters Art Museum in Baltimore, Maryland. He was appointed by President Clinton to his Cultural Property Advisory Committee between 1999 and 2003. Trained as a Byzantinist, Dr. Vikan has published and lectured extensively on topics as varied as early Christian pilgrimage, medicine and magic and Elvis Presley. He is adjunct professor at The Johns Hopkins University, Department of Art History, and a faculty member in The Johns Hopkins University School of Continuing Studies. A native of Minnesota, he received a B.A. from Carleton College and a Ph.D. from Princeton University. Dr. Vikan was on the Faculty of Session 482, Libraries and Museums in an Era of Participatory Culture (2011). He is currently working on his next book about the Shroud of Turin.